I am baffled by how many people still smoke. I continue to have pet-loving guardians tell me, “but, I smoke outside, or my spouse smokes outside.” This statement continues to show how naïve people are in regards to the effects on others of second hand smoke. When I review a radiograph of a pet who has a primary lung tumor my heart sinks. This is a needless loss of a beautiful life. What does your dog do the minute you enter the home? Sniffs you up and down, right? We all know how sensitive their noses are! And, of course there are the little ones who curl up in your lap and lie right on the residue. Then, they groom themselves and eat it. Those of us who do not smoke can smell the lingering residue on a smoker’s clothes or even in their hair! Don’t forget about the household teenager who thinks they are being sneaky and hiding their habit, yet exposing their own beloved pet! A case-control study of nasal cancer in pet dogs was conducted to test the hypothesis that exposure to environmental tobacco smoke increases risk. 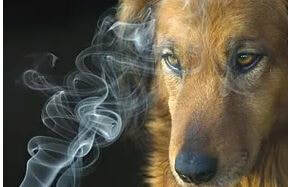 The data support an association between environmental tobacco smoke and canine nasal cancer. Am J Epidemiol 1998; 147:488–92. Passive smoking may increase the risk of malignant lymphoma in cats and (that) further study of this relation in humans is warranted. Am J Epidemiol 2002;156:268–73. Some inhabitants of homes with smokers have suggested air purifiers to be a solution. I would suggest take great caution with the placement of the air purifier in your home. It is common to place the equipment in a location which actually drags the toxins through the air, across the path of the pet or even near the areas where the pet or family frequent. This actually concentrates the exposure risk. Don’t forget, residues even fall into the pet’s water bowl! While a smoker is kicking the habit, clothing should be stripped and hair washed upon entering the home. Your pet should not be allowed into the same car where a smoker has been. If your pet has asthma, sinusitis, a difficult to manage skin condition or anything which is being called an allergy, regard this as a potential pre-cancerous condition and question this pet’s exposure to potential toxins such as second or third hand smoke. Some breeds of dogs and cats, especially those bred for vermin control, may take excessive interest in toads. Aggression in a dog is a scary thing at the best of times, and when aimed at people the dog knows, even more so. How on earth does a situation like this happen? These kind hearted people only want to help and then before you know it, the whole situation is out of control.